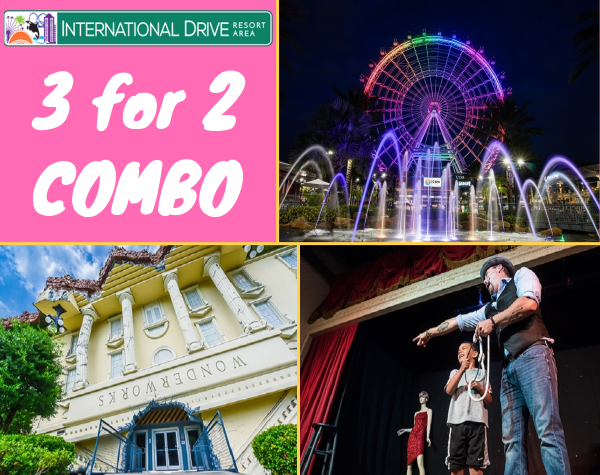 Enjoy 3 admissions for the price of 2 with the International Drive COMBO! The story goes like this....Removed from the glare of the media and the encumbrances of governmental restrictions; a group of scientists from around the world collaborated to find answers to the unexplainable. Their mission: to understand, predict and control these phenomena. In early 1998, during a top-secret experiment, something went awry. When the scientists attempted to harness the power of a man-made tornado, the giant, swirling vortex unleashed its power throughout the laboratories! The energy vortex lifted the research facility from its foundation and transported the laboratory hundreds of miles away to Orlando, Florida, where it landed upside-down, but otherwise functionally intact. 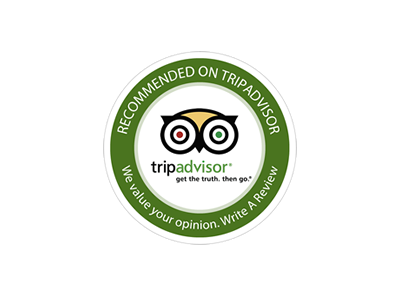 This is one of Orlando’s better kept secrets when it comes to a fun family night out and the winner of numerous local awards. 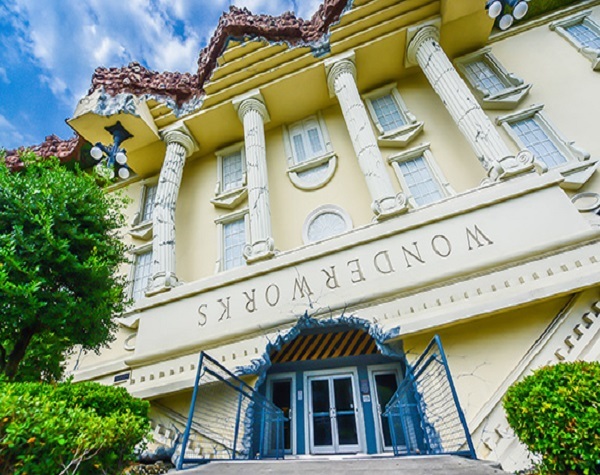 Located inside WonderWorks on International Drive this is a dinner show unlike no other in town. There are only 125 seats per show so it’s a very intimate experience where you won’t miss a thing! Expect to be impressed at this interactive, entertaining and hilariously funny dinner show. Shows are performed Sunday to Thursday 6PM Show Only and Friday to Saturday 6PM & 8PM Show Nightly. A Ride of Iconic Proportions: At 400 feet tall—the largest observation wheel on the East Coast of the United States—ICON OrlandoTM truly earns its name. Towering on the horizon and visible from miles away, ICON OrlandoTM offers guests the ability to see downtown, the theme parks and the Central Florida landscape like never before. ICON OrlandoTM is a new ride every time—from day to night, its colors always changing—but it always makes for a moment to remember. It is the perfect way to elevate an amazing moment. Find your Iconic Moment! Valid for use in 2019 only. Climb up to 36ft high on this 3-story glow-in-the-dark adventure, with over 20 different obstacles including suspension bridges, swinging beams, lily pads and lots more! Transcend time, space and imagination in this incredible theatre experience which combines 3D film with special effects and full motion seating, from subtle sensations to intense vibrations – plus loads of action and adventure! Compete against your opponents inside a huge blacklit maze as you outplay, outlast and outshoot the other players! Laser Tag combines innovative technology and fast-paced excitement, featuring more than 10,000 square feet of action and arcade fun in the WonderWorks basement! * Virtual Sports - A 3-dimensional world that’s completely generated by computer. * Earthquake Simulator – Hold on tight as you find out what a 5.3 earthquake actually feels like. * Global VR - Place yourself in the Desert War and move on to victory in this virtual combat! * WonderWall - Create a 3D impression of your entire body by pressing into this wall made of 40,000 pins. * Land the Space Shuttle - Experience first-hand the challenge and skill that’s needed to make the landing. * Astronaut Training Challenge – Spin 360 degrees on a gyro. * Bubble Lab – Make huge bubbles that cover your body. This ticket is a single admission that will include ALL WonderWorks exhibits, the 4-D Theater, Laser Tag and the Glow-In-The-Dark Ropes Course. Closed toed shoes are required for the ropes course. Tony Brent is the one man cast of dozens and a genuinely funny guy! He combines a mixture of amazing magic, impersonations and high-energy improvisational comedy to thoroughly entertain audiences of all ages. 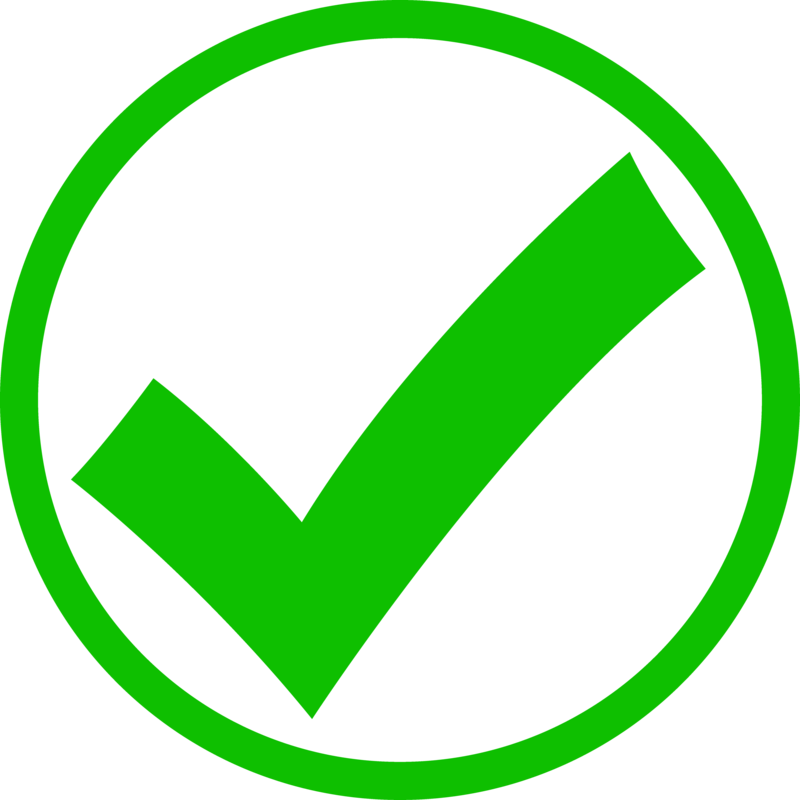 Minds will be read, predictions will come true, and audience members’ personal items will vanish and re-appear. 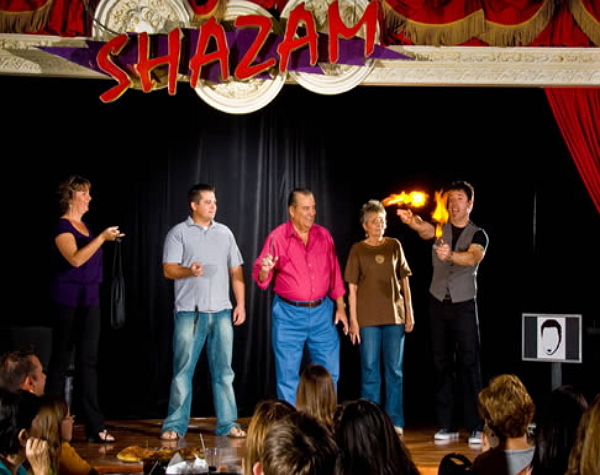 The Outta Control Magic Dinner Show provides a one-of-a-kind entertainment experience to the Orlando area with non-stop audience participation. The crowds don’t just watch the show, they become part of it. Visitors to the show receive tableside service with unlimited fresh hand-tossed cheese and pepperoni pizza, salad, beer, wine, soda, and dessert. The 90-minute experience will keep you on the edge of your seat and tickle your funny bone on a regular basis. The ICON Orlando is located at ICON Orlando 360TM on International drive. A play-at-your-own-pace kind of place, from the views around ICON OrlandoTM to conversations around the table with friends. It starts with the wheel, but the fun keeps going around and around long after the ride. Explore other unique attractions and don’t miss the all-new Orlando StarFlyer, the world’s tallest swing ride at 450 feet. Refuel at one of the many full-service restaurants and keep the party going well into the night. 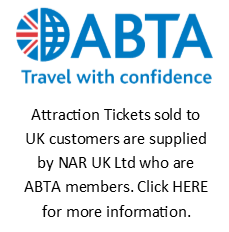 Explore dining, entertainment, attractions and shopping, all in one beautiful, vibrant setting. Valid for single ride. Duration is approx 22 minutes. On occasion ICON Orlando may close early for special events or stay open later. During thunderstorms and high winds, the attraction does not operate for health and safety.